“That would be a nice idea,” I responded. I’ve done it in 2015 and 2016, so it’s become a tradition in their minds. All of us remembered the difficulty of coaxing extra eggs from Nathan to even things up in previous years. We started mulling. Later, a life hack on Facebook caught my eye. It suggested hiding a different colour of egg for each child to ensure they get an equal number. I told my son I would hide blue ones for Nathan and pink ones for Avery. That seemed like a plan. We decided to change the venue to their house, as my place doesn’t provide much room for the kids to play. They were ready to go home as soon as they had found all the eggs they could in previous years. I debated whether eggs I found in the coming months were still safe to eat. 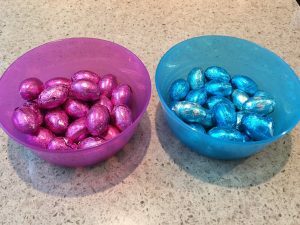 This year, I arrived with exactly 21 eggs covered in blue foil and 21 in pink. The kids had come up with an additional idea. They wanted to hide the eggs for each other. It took me a nanosecond to see the merit in that suggestion. I enjoyed watching Nathan find creative, but not too hard, places to hide eggs for Avery. I had similar fun watching Avery do the same for him. When we set them loose to hunt, they kept looking until they each found 21. What an improvement over previous years! The process was fair to both kids, the new method provided more time and scope for family bonding, and we knew there were no eggs left for mice, of the two or four-legged variety. Oh, and something else. The packages I bought included eggs covered in green foil. I enjoyed those in the days leading up to the hunt. A toast to new ideas. It’s Easter after all. This entry was posted in Writing on April 21, 2017 by Wilda.